Eve Wool/Contributing Photographer It?s that time of year again. Binghamton University students must decide their living arrangements for next semester, but it may be difficult to tell your roommate you don?t want to live with him/her anymore. Who you live with can alter your college experience tremendously. A student’s first-year college roommate has a potentially important influence on the student’s first-year college experience and outcomes, according to a 2006 study by The University of Western Ontario. Getting to know your random roommate takes some time; you may have to put up with habits and quirks that you didn’t even know existed. This person could end up being your best friend or worst enemy in a matter of a week. By now you should know whether or not you can live with him/her next year. Housing deposits are in and housing sign-ups are around the corner, so the pressure is on for students who have to decide where to live next semester. Wanting to switch roommates can be an awkward situation, especially when the feeling is not reciprocated. So what is the best way to break the news? 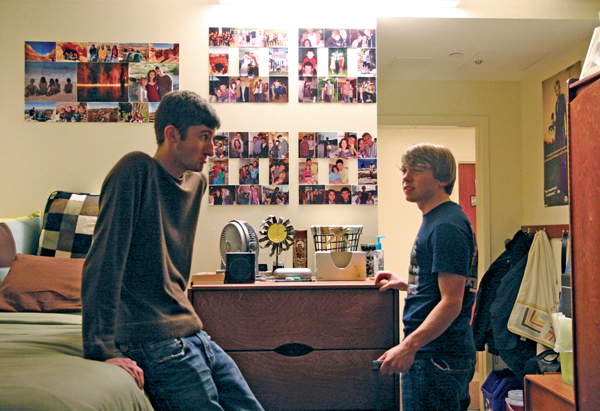 Most students don’t want hard feelings with their first roommate in college. April Pulgarin, a senior double-majoring in industrial and systems engineering and Italian, believes the conversation can be an annoying and awkward one. Timing is key. This is a conversation that you may be tempted to prolong. But to be fair, you should give your roommate a heads-up so that he/she can figure out an alternative. The last thing you want to do is screw over and leave him/her deserted in Dickinson Community. Grace Hoefner, senior assistant director of Residential Life, gave some advice on the issue. Each community has roommate match programs and meet-and-greets for your stranded roomie to find someone to live with. This depends on why you’ve decided to leave. If it’s because you’ve always dreamed of living in Mountainview College and your buddies have an extra spot, be honest. In most cases, your current roommate should be understanding. If you’re moving out because your current roomie drives you crazy, bringing up issues now won’t be too conducive. After all, you still have a couple more months of living with him/her and don’t want things to get more awkward than they have to be. Your approach may vary depending on how close you are with your roomie. If you don’t talk too much or your chats end up being confrontational, a text or e-mail may suffice but should be a last-case scenario because at the end of the day, you want to be respectful. Joe Crodelle, a junior double-majoring in math and biology, had a similar situation freshman year — he and some of his suitemates wanted a different suitemate for the next academic year.